A "must have" for every woman! 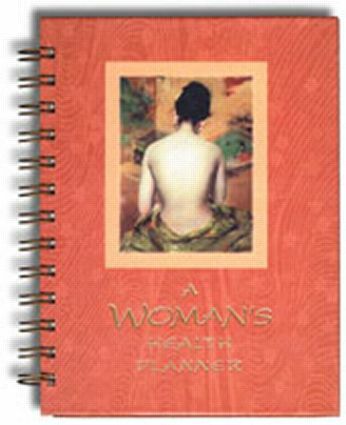 We couldn’t be more excited about this fabulous health planner designed especially for today’s busy woman. Next to chocolate and diamonds, this planner will be among a woman’s most cherished possessions—the ideal gift for loved ones, friends, and colleagues. Once a woman owns one, she will wonder how she ever survived without it. Don’t be fooled by the artistic design and elegant packaging—this gem is unbelievably functional and crammed with crucial information. It is many planners in one, helping to create order out of chaos, and consolidate all health care information in one convenient place. In short, a woman will find everything she needs at her fingertips. When an emergency arises, she will have that elusive pediatrician’s phone number, her insurance numbers, or the number of the pharmacist. For many women, life is so hectic that personal health concerns often get shunted to the background. Designed by women for women, this planner helps to keep health concerns in the forefront—where they belong. Become an active participant in your health care. As an informed patient, talk to your doctor with confidence. Know how to monitor your body for a wide range of problems, from yeast infections to breast cancer. Learn to relax without feeling guilty. Discover the best and easiest methods of good skin care, including a diet that helps fight skin cancer. Use the calendar to know which screening tests to take and when. See how to recognize and deal with menopause. Understand your heart rate and daily calorie needs. Know which vitamins and minerals you need, and in what quantities.